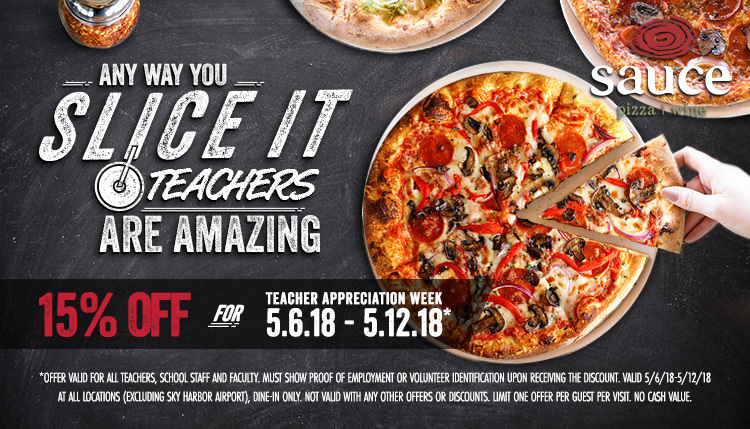 Teacher Appreciation Week – 15% OFF! Join us as we celebrate the hard work and important contributions of our teachers during Teacher Appreciation Week. All teachers, school staff and faculty can enjoy 15% off* their meal at any Sauce location (excluding Sky Harbor Airport) from May 6th thru May 12th. Stop by for a pizza, salad or even a pizza cookie to celebrate all of your hard work! Be sure to bring your proof of employment or volunteer identification to receive the offer. We proudly thank you for making a positive difference every day. *Must show proof of employment or volunteer identification upon receiving the discount. Valid 5/6/18-5/12/18 at all locations (excluding Sky Harbor airport), dine-in only. Not valid with any other offers or discounts. Limit one offer per guest per visit. No cash value.